A bit unusual at first, Roberto Martinez’s strategy in the transfer market has become quite familiar. He likes to shop in Scotland and Spain — markets he knows well and can compete with financially. He’s not afraid to dip into lower divisions, and values a season-long loan from a top club to boost competition for places in the squad. He is astute in his timing, snapping up players like Victor Moses and Nouha Dicko at cut rate prices when their clubs were in financial need. His buys normally fall in one of three brackets: young, upcoming but unproven; players who have fallen to the fringes and want to re-establish their careers; or foreign players seeking a stage on which to earn a move to a bigger club. The policy has yielded strong results. Signing two young central midfielders from Hamilton Academicals and moulding them into a Premier League partnership that out-tackled and out-passed the midfields of Manchester United, Arsenal, Chelsea and Liverpool last season borders on genius. Ali Al-Habsi, a reserve at neighboring Bolton, has been nothing short of outstanding. And Shaun Maloney, rescued from a hiccuping career for Celtic, has been revitalised in blue and white stripes after a slow start. But of all his success stories in the market — and there are plenty more — one signing stands out as an exception to his regular policy. Franco Di Santo arrived from Chelsea for 2 million pounds on deadline day at the beginning of the 2010-2011 campaign. The Argentine had been plucked from Chilean outfit Audax Italiano in 2008 after a decent scoring record in the Chilean League, the South American Copa Libertadores (Champions League equivalent), and the Copa Sudamericana (Europa League equivalent). 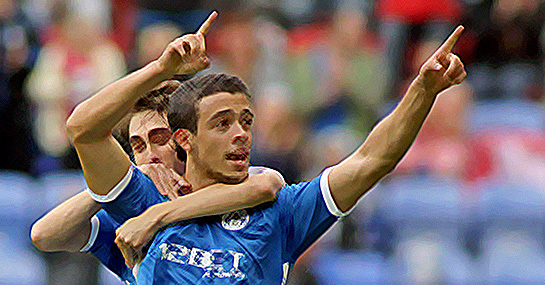 Having failed to break into the first team, Di Santo spent time on loan at Sam Allardyce’s Blackburn, but finished it with a desperate strike rate of 1 in 23 appearances, having been stuck out on the wing in a kick and rush system that clearly would not have suited him. The move was surprising because Latics had never before shopped directly from a top four club. Scott Sinclair had come in on loan the year before and it was largely assumed that Franco would follow the same path. The fact that Wigan bought him outright, at a bargain 2 million price, was taken by many to mean that Chelsea simply didn’t rate him. The consensus around the league, and in the media, was that he didn’t have the finishing to cut it in the Premier League. His transformation has been a joy to watch, but didn’t happen over night. Indeed, the goals took a long time to come. In his first season with the club, Franco was largely starved of service. In hindsight, it is not surprising that he, along with Mauro Boselli and Jason Scotland before him, struggled to score when flanked by Charles N’Zogbia and Hugo Rodallega — players who more often than not wanted to finish the move themselves. But there have been several turning points in the past year for young Franco. He started last season with a couple spectacular — if slightly fortunate deflected — strikes, which did his confidence a world of good. Then, in December, Roberto switched to the current tactical system employing wing-backs rather than wing-ers. The switch did more than change the shape of the team. It transformed the way the team attacked. Instead of the right-footed winger on the left, cutting in to shoot, we started seeing the wing-backs, left-footer on left and right-footer on right, bomb forward and launch crosses into the box. The higher number of crosses resulted in higher number of chances for the centre-forward, and Franco has benefited — as have Arouna Koné and Mauro Boselli in their appearances this season. The strike rate per minute on pitch of all three strikers if you include league and cup matches this season, is higher than any Latics striker in the Roberto Martinez era. They are the top three. The third and most recent catalyst, was the most recent tactical switch following Victor Moses departure and Arouna Koné’s arrival. Di Santo now has a strike partner, whose threat has freed up space for his clever running, and two of Di Santo’s three strikes this season have been assisted by the Ivorian. Di Santo now has service, confidence, and space — and his finishing has been been top class. If he can keep up this level of finishing, there is nothing to stop Di Santo’s progress. His technique is excellent, he has pace and strength, excellent work rate, fantastic hold up play and is an intelligent passer of the ball. But it is more than his attributes on the pitch that catch the eye. Sometimes, when players take the step down from a larger club, their egos get in the way. When you watch Di Santo play, his enthusiasm is clear, and his body language is that of a man proud to play for the club. His enthusiasm is infectious, and no doubt an important element in the dressing room. Martinez likes to speak about bringing in not only the right talent, but the right personalities. In Franco, he has a winner who also seems a genuinely nice guy happy to be there. As with many young prospects before him, this has not happened overnight. The club is only now starting to reap the benefits of the striker’s steep learning curve. But it has been a joy to watch his come into his own — long may it continue. At Wigan Athletic.